One of the most important developments in the understanding of law, what law is and why it is that law has authority in society, was the move away from natural law jurisprudence, articulated by Cicero, Montesquieu, and by Hugo Grotius in the nineteenth century. Natural law jurisprudence was the idea that law derived its authority due to the perfection and purpose of nature and divinity. Since true law had its origins and its sanction from nature and divinity, outside of society, it stood against whim, convention, custom, and caprice. Laws which were against natural law, against reason or justice, were not laws at all. Early in the nineteenth century, legal positivism, espousing a narrow definition of “positive law,” or those laws enacted by the State or sovereign in the form of commands, attempted a similar style of reasoning to that of earlier natural law jurisprudence insofar as, like natural law theory, it was both rationalistic and deductive. Legal positivism in John Austin’s prose, considered law to be law (as opposed to morality and custom) if it was a command from a sovereign authority that was coercive. This meant that going against the command of the sovereign brought threat of an “evil.” Law was sovereign, moreover, if it emanated from an authority which was subject to no other, such as a king or parliament, who was habitually obeyed. In my first post on the need for historical studies of the relationship between scientific and economic thought, I was greatly remiss in not discussing a scholar who has done a great deal to develop and organize work in exactly this area: Margaret Schabas of the UBC philosophy department. Thankfully, a quick reference by Tiago Mata over at History of Economics Playground set me aright. For a first pass through the existing literature, I’d like to take a look at her book, The Natural Origins of Economics (2005). The book is a critical-intellectual history. As an intellectual history, it sticks to an analysis of the published works of (mainly) canonical authors. Where a straight intellectual history might recount the arguments that historical authors explicitly made, critical-intellectual histories draw out continuities and breaks over time in authors’ lines and methods of argumentation. Like many intellectual historians, Schabas is mindful of detailed arguments in the secondary literature, and does a good job of acknowledging, consolidating, communicating, and building on the gains of that literature. Schabas argues that where 18th-century philosophers of political economy understood their subject to connect deeply to nature and natural philosophy, economics began to explicitly frame itself as a science of peculiarly social phenomena following John Stuart Mill’s Principles of Political Economy (1848), the rise of the idea of “the economy” as an object of study, and the rise of neoclassical economics in the late-19th century. 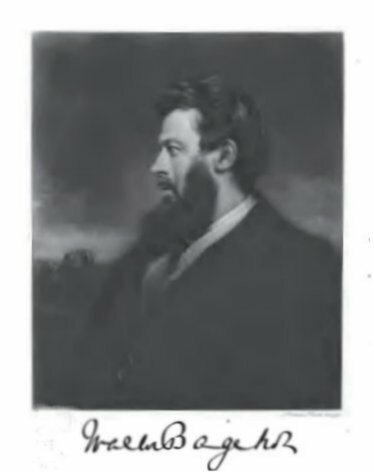 Walter Bagehot (3 February 1826 – 24 March 1877) in both Physics and Politics (1872) and in The English Constitution (1867) combined a historical and functional analysis of political institutions with an anthropological account of their primeval origins and the forces behind their growth. These writings on political theory combine the sociological account of the utility of institutions found in Alexis de Tocqueville’s Democracy in America with the economic and material anthropology of Henry Maine’s Ancient Law.